The Small HD Focus is a daylight viewable 5 inch HDMI monitor perfect for ensuring your shot is in perfect focus. This bundle includes accessories to power your Sony Mirrorless Camera. See 'Whats In the Box' for contents. 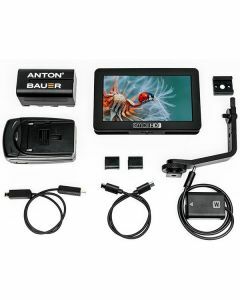 As well as the FOCUS accessories this bundle includes Sony L-Series battery adapter capable of passing power to your Sony Alpha Series Camera through the FOCUS' auxillary power out and camera specific battery adaptor cables. Compatible cameras include: a6300, a6500, a7, a7 II, a7R, a7R II, a7s, a7s II.